Do police kill their own to cover up corruption or crimes by their own? Why is it so hard for people to accept a Police Chief may be a criminal? With thousands of documented cases of bad cops, killer cops, corruption and scandal, bad people commonly get past a poor hiring system and become bad cops who victimize us all. “Sometimes bad things happen to good people” Is very true and accurate when describing the American legal system today. Even Police officers who do the right thing are often ignored and victimized to hide the even bigger picture. What’s hard for Americans to accept is an image or title being dishonest or evil. The fact that if the word Police, Judge, Doctor, parent, child or government official is used in conjunction with a named suspect, they make excuses that they can’t possibly be guilty. No one wants to believe a child could want their parent dead, drugged or eliminated to get at their inheritance. But I’m here to tell you as a victim and accuser that this goes on everyday in America. Good, honest people come forward to expose a crime, however when those criminals are not what the public or system want’s to accept they don’t prosecute or investigate them. Police are a perfect example of a position which allows criminals (without records), mentally unstable, bullies, sociopaths and psychopaths the ability to gain authority over us and possess deadly force. When such monsters are hired its almost impossible to expose them or remove them. Further we reward them with paid leave, promotions, paid protection and tax paid benefits and legal help. The tax payer is victimized by these monsters let loose upon the public and then the tax payer is forced to pay huge legal fees and settlements. It’s not changed because its a win-win for those involved in government legal actions and positions. We need to demand protection and reward for anyone, especially police who come forward with information regarding wrongs, corruption or crime among police and our courts. There is new information out of Fox Lake, where it has been six weeks since the death of Lt. Joe Gliniewicz. WGN Investigates has learned that the village sought approval to pay more than $25,000 to a private detective agency to investigate its former chief of police. The chief was placed on paid administrative leave after a village administrator started questioning what she called lax discipline of another officer. That officer was accused of verbally and physically abusing a man in custody. The incident happened in December, but the village review didn’t begin until eight months later. The chief resigned after being put on leave. Two days later Gliniewicz was asked by that administrator to help with an internal police review. 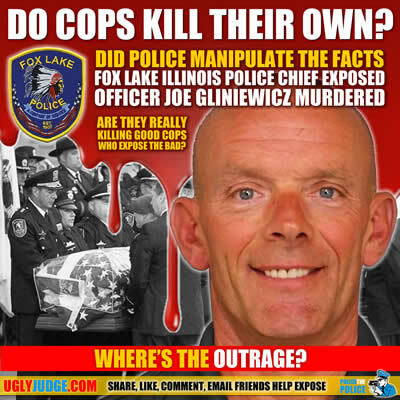 The next day, Gliniewicz died after being shot twice with his own weapon. Investigators have not ruled out suicide. The village says its investigation is ongoing. These are a handful of events that got publicity, I’m sure the majority never get to the news or media. But I can tell you from personal experience if you think the public can’t get justice against bad cops, judges or the system, good cops have even less success. Think about it, exposing people you may have to rely on one day can be a hazard to your health. We’re not talking about all cops being honest, trust worthy and good people. We allowed them to create a system that protects them, even if dishonest, criminal, wrong or sociopaths. Some of the worst offenders have made their way into top management and positions. They protect those who keep quiet and send hidden messages of threats to those who might expose them. LAPD Officer Christopher Dorner was murdered by his own, no matter what you feel this officer did wrong in his fight to expose the LAPD evidence proves he was burned to death. Perhaps a way to stop the truth from being made public. Where’s the outrage when there is 100% audio evidence that Dorner was burned alive? Dorner wanted to get attention to the crimes against him and corruption the only way he could. What the bad cops want you to think is “He was crazy” which is a common way the guilty handle anyone who exposes them. “If you don’t like the message, kill the messenger”. This age old concept is still used today by the corrupt, criminals and dishonest. People who have never had their lives destroyed by a system that refuses to accept the truth don’t understand how Dorner could have done what he did. Yes people it gets that bad. When you go before a known corrupt court with Judge David Yaffee . While Americans want to believe we have Justice, truth and freedom, the truth is when you try and use your rights you find out its all a lie. Dorner did the right things, went to the right people. What did Dorner get for his honesty and integrity? Why was everything Dorner exposed ignored, why was his obvious murder ignored? Because the same people who should be investigating and prosecuting are the in fact the guilty and criminals. What would you do if you told the truth doing the right thing and instead of being honored you were fired, ignored, attacked and punished for doing the right thing? Wilmington, NC — A former Wilmington Police Department Sergeant has come forward alleging that he was fired for trying to expose the corruption within the ranks. Curt Stansbury wrote a letter to local media outlets earlier this week explaining the hostile workplace environment in which he worked and how trying to change it, got him fired. Retired Philadelphia police Captain Ray Lewis,arrested yesterday after joining up with the Occupy Wall Street process, has quickly become one of the more iconic figures from the movement’s two month’s anniversary. After we noted his arrest and put up several pictures of the event, we were contacted by everyone from The Associated Press to worried parents who thought they could find their son, who had been in the same paddy-wagon as Captain Lewis. This is a story about how bad it gets in a city known for having the highest crime rate in the country. It’s about a scoring system put in place to lower that crime rate and a group of rogue cops who figured out how to game the system by writing phony tickets and making false arrests. In the process, they undermined the authority of the badge, trampled people’s civil rights, and made the city a worse place to live. It’s a story about the law of unintended consequences. It’s a story about Shanna Lopez, badge No. 8695, and how stumbling into the scheme during her rookie year ruined her career and her life. DESERT HOT SPRINGS – A civil lawsuit filed against the city by former Desert Hot Springs police officer Andrea Heath — who died in October from a gunshot to her head — will move forward with her son and the father of her young daughter as plaintiffs. Bogota, NJ A New Jersey police officer has won her job back after being fired from preventing her fellow cops from brutally beating an emotionally-disturbed young man. Louisville, KY A New Albany police officer of 19-years is being fired after she blew the whistle on her department. The biggest problem is how they refuse to investigate and prosecute. The same old lies “Wait for a full investigation”. Which really means “Lets stall for months so people forget what happened” Then do nothing as we have always done.